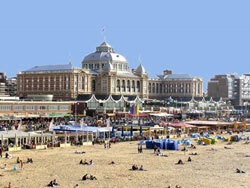 The district of Scheveningen (a prime area) has been famous as a seaside resort since the early 19th century. Its sandy beach slopes into the North Sea, and locals and tourists alike enjoy walking along the shore or the long pier, visiting the lighthouse, staying at the seaside hotel that has been there for more than a century, and joining the beach competitions and events that are held there all year round. Events include the Winter Swim, held on New Year’s Day; Flags Day, which includes a fish auction; and the fireworks displays throughout the summer. Many activities are also held on water, from fishing to windsurfing and sailing. One of the district’s neighbourhoods, also called Scheveningen, is right behind the seawall. This area includes the central Scheveningen Village, the old port of Havenkwartier, and Seinpostduin Quarter on the beach. Bars, restaurants and activity centres, apartments, large houses and social housing, and fishing concerns and tourist attractions are all here by the beach. Some houses date from the early 20th century when development began, but newer apartments and buildings have also been built here over the years. Plans for the redevelopment of the area, particularly in the Havenkwartier, include demolition of several social housing projects, making way for more upscale residences and commercial concerns. Duinoord is one of the most picturesque areas in The Hague, thanks largely to the architecture of its houses, which range from mansions and detached villas in the centre to more typical, more modest homes. These smaller residences have steep gabled roofs, turrets, carved ceilings, upper-floor balconies, and bay windows looking out onto the street. Duinoord has a bohemian, cosmopolitan feel. It is popular with young people and the international community, and near several international organizations. There are a few shopping streets, most notably the Reinkinstraat. At the centre of the district is the Sweelinckplein, a public square bordered by wide streets and three-story brick houses. These large houses are usually split into the upper and lower areas for double residency. Other types of residences in Duinoord include portico houses, used as apartments, and an unusual kind of house called a basement house (consisting of a basement and the ground floor and an entrance for each level). Duinoord’s older areas date from the late 19th century, designed in neo-Renaissance style, favouring Romanesque and Gothic architecture. In New Duinoord, the architecture is primarily Art Nouveau, which became popular at the turn of the century. In the reconstruction after the war, Duinoord was planned to house the residences the wealthy and the upper-middle class. Like many parts of The Hague Centre, Duinoord is in the midst of urban renewal. One of the upcoming projects in the district is creating a play area for children. While the coastal village of Duindorp has been around for 700 years, the sub-district that grew around it in the last century was originally built for the fishermen who worked in the area. The brick houses and apartment buildings built from 1915 to 1930 were designed according to the simple and austere style of the great Dutch architect Hendrik Berlage. The Juliana Children’s Hospital was built here in 1929. During World War II, many houses in Duindorp were demolished when the Germans had the Atlantic Wall constructed along the western European coast. Today, Duindorp’s residential units are maintained by the local council. A district-wide, multi-phase restructuring project is underway. More than a thousand units have already been demolished and hundreds of new homes built in their place. During this restructuring period, emphasis has also been placed on creating public spaces. Duindorp is a residential area with no through road. Away from the beach, Scheveningen has a lot of green spaces in the several smaller neighbourhoods that make up the district. The Belgisch Park/Harst Quarter Corner is one of the most prosperous areas of The Hague. It is a villa park, originally called the Dutch-Belgian Park, designed by the architect T. Coppieters. It was built at the end of the 19th century by a tram company as a residential district, so that the trams could have more passengers in the area. Belgisch Park currently has a population of about 7,900. Many grand houses built before and after World War I around the district’s oldest part, the Belgian Square. Many were imitations of pre-modern styles, ranging from Old Dutch to Baroque, Gothic and Renaissance, but others were Art Nouveau. These lovely houses took the form of large villas with wide wooden verandas, set among the trees. Belgisch Park has been partly renovated in recent years, giving the northwest end a new look, with a fairly new apartment tower and a refurbished hotel. Westbroek Park/Duttendel is a fashionable, high-income area, like Belgisch Park, but with fewer residents. It has many green spaces around the area's expensive houses. A large proportion of the area’s residents are elderly Dutch. Many of the residents also come from other parts of the country and are not native Hagenaars. Westbroek Park is known for the hundreds of varieties of roses in its gardens, from miniature blooms to climbing vines. New specimens are sent to the park to be grown every year from all over the world. Van Stolkpark is another villa park in Scheveningen. The park is bounded by the Scheveningen Copses, thickets of trees taken from plantations. A large pond lies sheltered behind the trees. The first villas here were built at the turn of the 20th century. 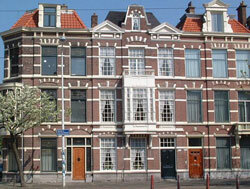 Most buildings from this period are in the style of the New Hague School of architecture, popular at the time. Hotels and apartments filled out in the area in the succeeding decades. Van Stolkpark has changed significantly over the years. Many mansions and villas have been converted into offices and schools. Other villas have been remade into expensive and upscale apartments. Much of the green space has disappeared. Some park areas have been paved over for parking lots. A restaurant and inn that once stood near the Van Stolkpark pond is now a sports complex with tennis courts. The Geuzen and Statenkwartier sub-district is in the northwestern part of Scheveningen, situated between the sandy beaches and the city centre. Stately mansions in the Art Nouveau style along wide, tree-lined avenues have made this a prime area. The largest houses can be found on the quarter’s edge, where the broad streets and larger squares are found. In contrast, the Geuze Quarter, a small neighbourhood within the Statenkwartier, has narrow streets and smaller houses. Geuzen and Statenkwartier was devastated during World War II, when the Germans built the Atlantic Wall along Europe’s western coast. After the war, offices and schools went up as well as new housing—villas, townhouses and apartments. Many of the large houses have been made into offices, though their external appearance has not changed. The main streets in the neighbourhood are the Frankenslag and Frederick Henry Avenue, a prominent shopping street. The intersections between the Statenkwartier’s diagonally arranged streets are residential areas, including Prins Maurits Square, the State Square, and Frederik Hendrik Square. This sub-district has a distinctly youthful population, and a large number of expatriate residents. Among its attractions are trendy bars and restaurants, a panoramic film theatre, the Hans Gemeentemuseum (which has works by van Gogh, Kandinsky and Mondrian) and a tourists' favourite: the miniature model city of Madurodam, with its buildings, streets and canals built on a 1:25 scale. Thick with trees, Zorgvliet is a villa park built in the early 20th century. It was badly damaged during World War II. Today, many of its large houses are used as ambassadors’ residences and international institutions—including the Peace Palace, where the United Nations’ International Court of Justice, the Permanent Court of Arbitrations and The Hague Academy of International Law are located.